This arrangement is not required and you are free to organize your ROMs as you prefer. Playlists (or Collections as they are sometimes referred to) are the lists of games and other content that can be generated automatically by the RetroArch playlist scanner, generated by a third-party playlist utility or script, or edited by hand in a text editor. RetroArch incoporates a ROM scanning system to automatically produce playlists. Each ROM that is scanned by the playlist generator is checked against a database of ROMs that are known to be good copies. Finally, the content must match existing databases from the libretro-database README. If those conditions are met but content is still not being added automatically to a playlist, consider submitting an issue report on github. RetroArch will attempt to detect and use the correct core for use with the ROMs that are used as part of a playlist. Under some circumstances, it may be useful to manually set a particular core for one of its playlists. This can be accomplished within the Playlists submenu in the RetroArch settings. Each playlist is a plain text file with an extension of .lpl. RetroArch 1.7.5 and later uses a JSON playlist format, although the backwards compatibilty remains for the deprecated "6-Line" playlist format. Note: The paths in playlist files need to use the correct 'slash' character for the user's platform. Linux, OS X, and Android systems including Lakka and LudOS require forward slashes /, while Windows and DOS systems require backslashes \. The built-in Notepad editor cannot work with cross-platform text files such as RetroArch playlist files. Many users and developers recommend the free Notepad++ as a replacement although most alternative text editors will also work. The following example is a single-entry MAME 2003-Plus playlist for Alien Arena -- the silent version of this game is available through the RetroArch Content Downloader found in the Online Updater menu. The playlist is named MAME 2003-Plus.lpl which means it will match the existing icon for that core's playlists in the RetroArch assets pack and display it for the playlist for menu drivers that implement playlist icons. The Alien Arena romset is located at C:\retroarch\downloads\alienar.zip; note that the backslashes are doubled in JSON-formatted playlist entries so that the value of the path entry is C:\\retroarch\\downloads\\alienar.zip. You can omit the CRC or Serial for a manualy created playlist entry by using the word DETECT instead, although it may limit your ability to use netplay for this playlist entry. This playlist format is deprecated and may not always be supported by RetroArch in the future. New playlists should be created in the JSON format. The path to the ROM. This can either be an 'absolute' path or a path relative to the current working directory. The path to the core, this libretro core will be used to launch the ROM. You can use the word DETECT in place of the core path here. Once this is done you can set the core to be used for this playlist via the RetroArch GUI. CRC or Serial number for database and other matching purposes. You can omit the CRC or Serial for a manualy created playlist entry by using the word DETECT here instead, although it may limit your ability to use Netplay for this playlist entry. 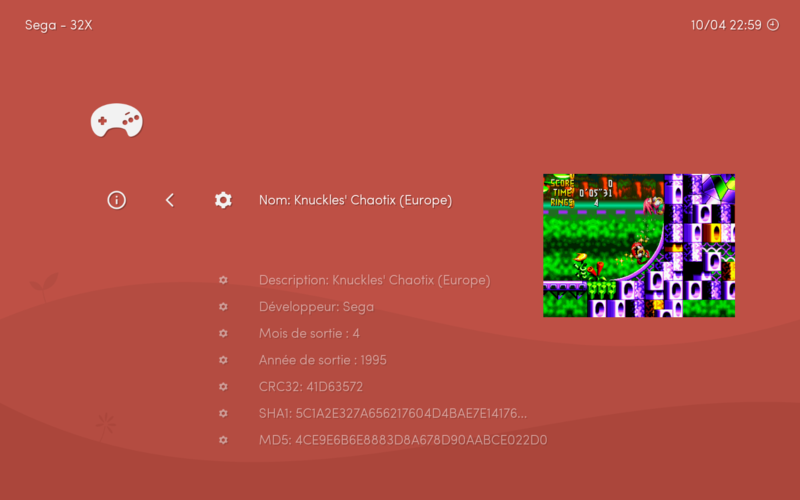 RetroArch provides packs of thumbnails suitable for use with many emulated systems. These thumbnail packs are recommended for most users and can be installed connecting to the internet and using the built-in thumbnails updater, available from the online update menu within the RetroArch settings interface. These packs can be downloaded manually from http://thumbnailpacks.libretro.com and individual thumbnails from within the packs can be downloaded from http://thumbnails.libretro.com. Users who wish to use their own thumbnails can do so by naming PNG image files according to the RetroArch naming convention. Thumbnails should be stored in subfolders within the configured RetroArch thumbnails directory within a subfolder named exactly the same as the playlist, except without .lpl at the end. Example: If your playlist is named Atari - 2600.lpl, then your Atari 2600 root thumbnail folder should be called thumbnails/Atari - 2600/. Within this root thumbnail folder called Atari - 2600, you should then create subfolders named Named_Boxarts, Named_Snaps, or Named_Titles for boxart/cover art, in-game snapshots, and title screens, respectively. Regardless of whether you download the RetroArch thumbnail packs or use your own custom thumbnails, you can use the RetroArch GUI to set which type of thumbnail to display. In order to change this setting, go to Menu Settings, and change the Thumbnails option to reflect the type of thumbnail you wish to display.